The key factor shaking up the rankings this year is the tightening of regulatory oversight worldwide. 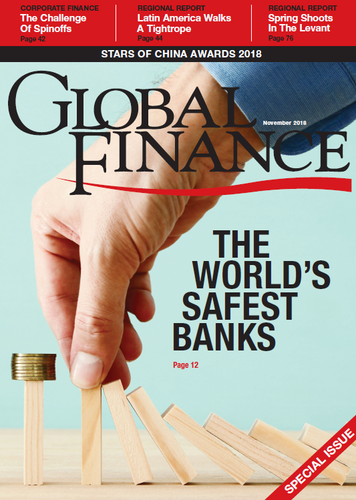 Almost one in four countries experienced a change of their Safest Bank in 2018, as winners were rewarded for improved financial profiles, higher ratings and asset growth. Regulatory strictures have forced European banks to shape up, with positive results for many. Middle East banks are generally strong, but will need to grow their books of quality loans to improve profitability. Rating-agency reappraisals shake up this year’s ranking of the world’s safest banks. China has the world’s biggest banks, so it’s no surprise that it leads the emerging markets rankings. The rest of the BRICs are well represented, too. The world’s biggest banks are even bigger than last year. China has the biggest; Europe has the most.